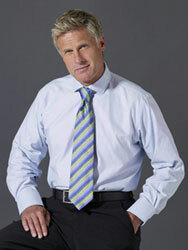 W.H Taylor Cream shirt is as compatible with a sports coat or pullover as it is with a suit. 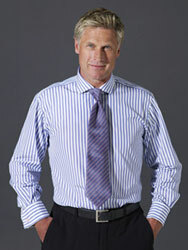 W.H Taylor’ shirts are made from two fold 100% cotton poplin. The superfine weave (140's) of this shirt is so fine it feels like silk against the skin and the tightly woven construction gives very clear stripe and checks. * Important - Do not use your trouser size. To measure sleeve lengths for the perfect fit, take a tape measure from the centre of your neck, across the top of the shoulder and down the outside of your arm. Measure to the point you want your sleeve to end (normally about one centimetre past the wrist bone), but remember to keep your arm straight down by your side. If the measurement falls between two sizes, allow for the longer. How do I measure my own collar size? Place a tape measure around the middle of your neck, allowing enough room for the tips of two fingers to be inserted comfortably between the tape measure and the neck. Our tailored fit shirts (image 1) have had the chest and waist slimmed compared to our regular fit shirts (image 2).The sleeves have also been made a bit slimmer and the body length has been shortened. Stocked shirts are available in (collar/sleeve) 14.5/34", 15/34", 15.5/34.5", 16/35", 16.5/35", 17/36", 17.5/36", 18/36.5", 18.5/36.5". Slim (was x-slim) 14½" 15" 15½" 16" 16½" 17" 17½" 18" 18½" 19" 19½" 20" 20½" 21" 21½" 22"
56½" 58½" 60½" 62½" 64½" 66½" 68½"
56" 58" 60" 62" 64" 66" 68"
22" 22½" 23" 23½" 24 24½"
* Back length increases 2" for sleeve over 35"
19" 19½" 20" 20½" 21" 21½" 22"
58½" 60½" 62½" 64½" 66½" 68½" 70½"
58" 60" 62" 64" 66" 68" 70"
23½" 24" 24½" 25" 25½" 26" 26½"
Please note that the Butterfly gusset is not available on the 'slim ' shirts due to fitting. 61½" 63½" 65½" 67½" 69½" 71½" 73½"
59" 61" 63" 65" 67" 69" 71"
59½" 61½" 63½" 65½" 67½" 69½" 71½"
How long are our ties? Our ties are cut to a minimum length of 58" (147cms) which are design to fit most collar sizes and 9cm at the widest width. Please remember that we aren’t a mass manufacturer of shirts. Whilst this brings you many benefits including the widest variety of luxury and bespoke shirts – we can’t dispatch things overnight. We strive to have our bespoke shirts made within 3-4 weeks of order placement – dependent on demand. Delivery in the UK is free for all orders. We have arrangements in place for EU delivery at £10.00 and international delivery at £15.00. What happens if my bespoke shirt doesn’t fit properly? First step, don’t panic! We know that mistakes can happen sometimes with measurements. So, we’ll always accommodate shirt alterations. We want you to enjoy our shirts after all. You may cancel any orders for stocked items as ties, cufflinks and accessories for any reason by issuing the Company with a notice of cancellation in writing within 14 working days of receipt of the Goods quoting your order number. This does not apply to items personalized or made to your specification (i.e. shirts), which can only be cancelled with 7 days from the date of the order or by mutual agreement. You must take reasonable care of the Goods whilst they are in your possession and must not use them prior to returning them to the Company. Any Goods returned must be in the original packaging in the condition in which you received them.